Location Fees: Most State-administered locations are free to use for filming, but there are several exceptions: airports, harbors, and highways under the jurisdiction of the Department of Transportation are $100/day; small boat harbors, launch ramps, and beaches under the Department of Land and Natural Resources / Division of Boating and Ocean Recreation are $100/day; parks and beaches under the Department of Land and Natural Resources / Division of State Parks have a $100/day nonrefundable fee; and locations that fall under the Dept. of Hawaiian Home Lands are $1,000/day. Depending on the complexity or sensitivity of the shoot, productions may also be required to have supervisory state personnel present on location during a shoot at $50 per hour (with a 4-hour minimum per day). Use of DLNR’s waterborne vessels for monitoring purposes will be charged a $50 per hour fee (with a 4-hour minimum per day). For your convenience, the Standard Film Permit Application may be downloaded from the links below as a fillable PDF or fillable MS Word document. We suggest that you save these forms to your computer, fill them out on your computer, print them, and fax them to us for processing. 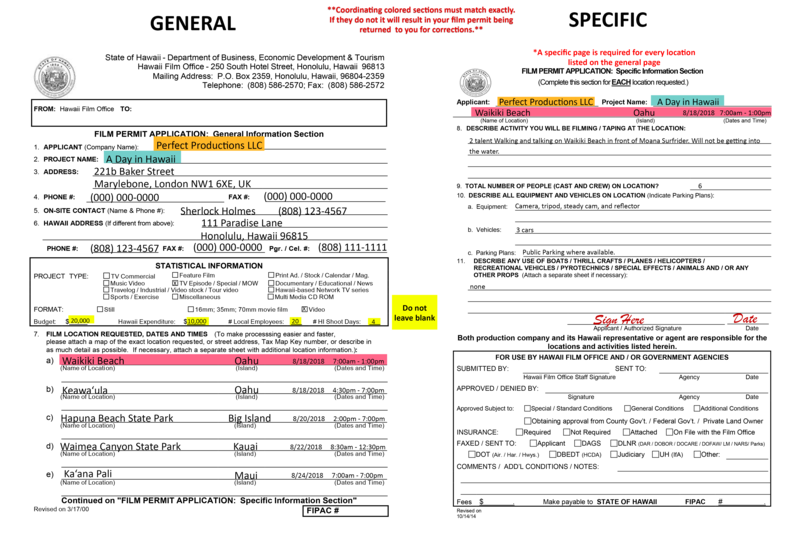 Download and fill out the “GENERAL INFORMATION SECTION”form of our Film Permit Application (below). Be sure to provide all statistical information requested. Use the second page of the General Information section for additional locations that do not fit on the first page. Download and fill out one “SPECIFIC INFORMATION SECTION” form for EACH location requested. You must sign each “Specific Information” sheet you submit. Please provide easily readable map(s) to expedite the approval process. An aerial map (i.e. a screen shot from this map) is preferred. Please circle and mark the whole area of intended filming. Attach a Certificate of Insurance with your permit application. Click here for the requirements. 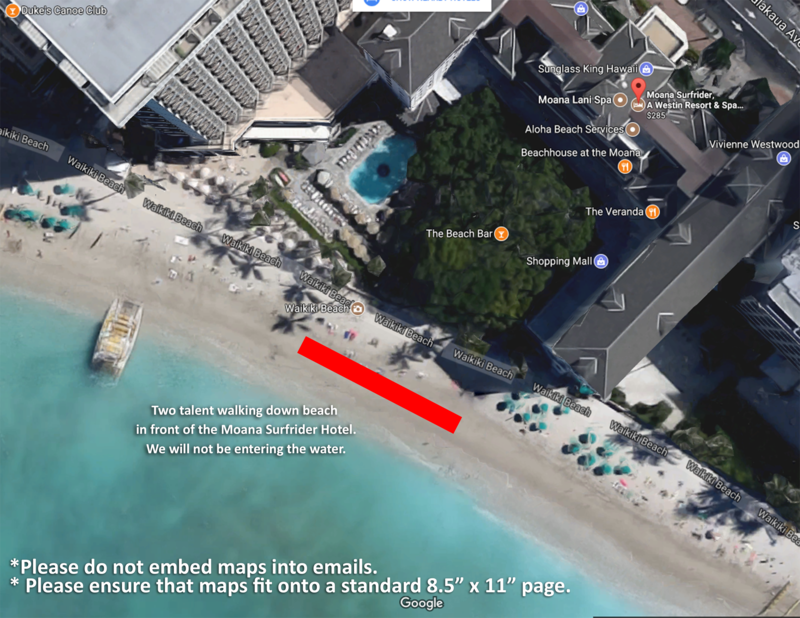 Send your entire application (“General Information Section” form, signed “Specific Information Section” form[s] with corresponding map[s], plus Certificate of Insurance) to the State of Hawaii Film Office via e-mail at info@hawaiifilmoffice.com or via fax at (808) 586-2572. Once approved by the proper state agencies, your film permit will be emailed to the contact e-mail address listed on your “General Information Section” form. A copy of the permit should be with the production at all times while filming on the approved location. Although hard copies are preferred, digital copies on a phone or tablet are accepted. The contact person listed on the application will be responsible for ensuring that the production abides by the conditions of the permit. Use the “ADDENDUM”form only if you need to make changes to an already approved location on your film permit application. If you want to simply add a new location to your existing permit, please list it under #7 on your “General Information Section” form and resend it together with a “Specific Information Section” form with corresponding map for that new location. 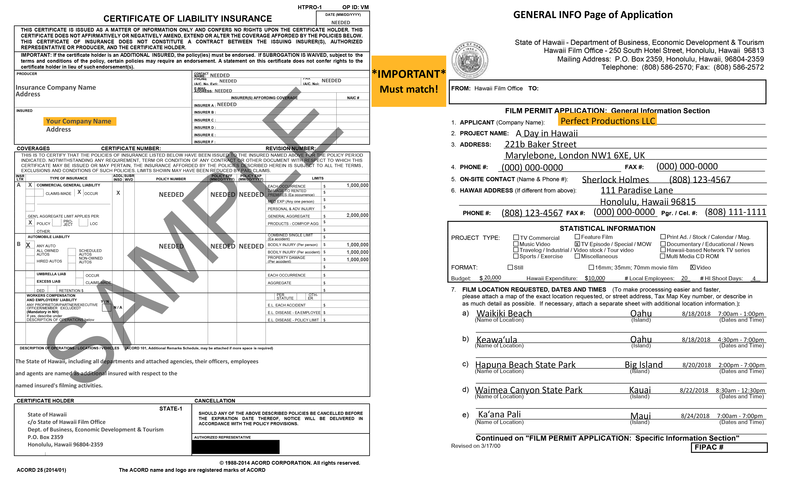 Here are examples of how a completed standard film permit, corresponding map, and certificate of insurance should look. in section 7 of the general. (for changes to already approved locations only). section 7 of the general. Keep in mind that your application is faxed back and forth to various State agencies for approval. Readability becomes a problem if the original is not legible. A form filled out on your computer is definitely preferred. If your application is not legible, you will be asked to resubmit it. For water filming please indicate the area to be used as: “Waters off of (location)” A certified water safety professional must be hired when there is water activity. Please contact us for more information before submitting your application if your intended filming involves water activity. We can only process Film Permit Applications that list specific locations (other than DLNR Open/Accessible Sites). Locations listed as “TBD” cannot be processed. On the Specific Information Sheet(s), list only the activities related to that specific location. Please contact us at (808) 586-2570 or info@hawaiifilmoffice.com if you have any questions.